Now that we have had a month plus to look at, consider, and make cunning plans; lets get down to the brass tacks of this book. Some would say that the strength of this new codex lies in the Ravenwing and Deathwing special rules. Some have said the strength of this codex is in the special characters. I disagree with all of these opinions. The heart and soul and strongest rule of this codex is Combat Squads. Some readers may ask why I think this is the greatest achievement of this codex. I’ll explain. Recently I’ve been noticing a disturbing trend in Basic Marine Armies. Many Marine players have been moving in the direction of squads as delivery systems for tooled up characters. I don’t blame players for this shift. 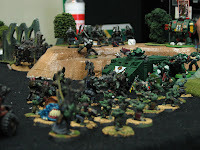 Since 3rd edition 40k I’ve seen marines played one of two ways: Firing Line, and Blitzkrieg. The Firing Line tactic has been the most prevalent, while Blitzkrieg has been a more recent advent of 4th edition. Most Marine players, myself included, have noticed that most of the unit weapon upgrades were point sinks to stick unused points in. Flamers, if taken, barely got fired. Melta Guns, might have, got a single shot off per game. Plasma Guns are useful if you plan on standing off and shooting, but are otherwise a waste especially if you wanted to assault. Infantry heavy weapons of any sort were only useful when you were standing off and shooting, but became completely useless when the battle became a running gun fight. The Combat Squad special rule finally allows the heavy weapons to do their job, while the special weapons can move up and get into firing range. It gives the Dark Angels a strong firebase, without affecting their ability to run and gun. I touched on this a little in the last section. Most of the missions require that the player move out of their deployment zone and secure, capture, or destroy something. Very few of the missions allow the player to win by sitting back and shooting. Because of this many Marine armies went with the objective denial strategy, which would almost always run into problems if their opponent got last turn. Besides the Imperial Guard and the Land Raider Transport option, there are no other armies that I know of in 40K that can create multiple scoring units from one slot on the Force Organization Chart. The ability to have multiple scoring units from one slot is invaluable. It is invaluable because the chosen force will give up Victory Points stingily. What these multiple units also do is saturate the field with individual units. Imagine for a moment that you and your opponent both have 11 Force Organization selections, but because you are playing Dark Angels your 11 selections are 22 scoring units. Not only are they 22 units, but they are 22 individual units that must each be targeted separately. Most armies have a difficult time killing 5 marines with a single unit, and that alone is the beauty of the Combat Squad special rule. The Ravenwing and the Deathwing have their place within the ranks of a Dark Angels army. However, if you want tactical flexibility, the ability to accomplish your missions, and more scoring units than your opponent then accept no substitutions. Take Combat Squads. In our last installment we talked about math and using parts of your body as reference in aiding you in guessing range. In this installment we are going discuss battle field reference points and advanced math techniques. It always helpful to have a scratch pad at your table for these techniques. Now that you have made a mental or written map where these point are you are ready to apply step two. Scarecrow in “The Wizard of Oz” summed up the principle we are going to use: Pythagorean Theorem. It states: In any right triangle the length of the hypotenuse is equal to the sum of the squares of the two sides. Simply put a2 + b2 = c2. This is where we combine techniques. Using our battle field references, we can now determine where a unit is on the field plus or minus to the closest point. So now all we do is apply a little math and we will know exactly where they are. Example: Enemy unit is 6” out of their 12” deployment zone and 6” to your left of the center line of the table. Your Empire Mortar is at 6” in your deployment zone and 12” from your right table edge. This means that your opponent’s unit is 18” to the left of your mortar and 24” forward. This makes their unit exactly 30” away from your mortar. First and foremost: work on these calculations during your opponent’s turn. This will speed up how long you take during your turn. Next you want to practice. If you practice you will increase your speed, and after a while you’ll be able to eyeball ranges. Third don’t be afraid of over or under guessing you will improve with time. Tip 1 A very common occurrence in WHFB is to see your opponent measure the distance between their missile troops and your troops to see if they are in range. This measurement works both ways. So the tip is never let any measurement get wasted. If you get quick enough you’ll be able to see potential charge distances, firing distances, and other items that are considered guesses. For example I had an opponent not believe that I was in range with a Whirlwind shot I had made, and asked me to measure it out. I measured the distance for him, but as I was doing this I made mental notes of everything that I could possibly hit. Tip 2 Mark your deployment zone short at the beginning of the game. You can mark it short, at most, by about an inch to an inch and a half. The human eye, and most casual observers, won’t be able to tell 10 1/2” and 12” apart. It looks pretty close. If your opponent is working under the assumption that you deployed 12” in when you really deployed at 10” then you might experience a failed charge or they miss with missile troops. I’ve seen many a dwarf player do this so that they get the ability to charge. So have you ever played against anyone who seems to never miss with their artillery? Or played against a marine player that when you question his distance retorts with, "You're right it's not 48 inches it's 43 and 3/4 inches." What makes it worse is that they are right. Well dear reader I am about to expose the secrets and mysteries behind guessing range. 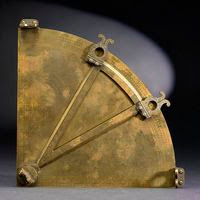 Ever wonder how ancient man made measurements? It was with his body. There are only two measurements that we'll need to concern ourselves with the span and the cubit. A span is the measurement from the tip of your thumb to the tip of your pinky when they are spread out at their widest. The cubitis the tip of your middle finger to your elbow. The measurements are roughly 6 and 18 inces respectively. These are good reference guides if you need a rough idea of what 6 or 18 inches looks like. The better method is math. Math is your friend. If math is too tough for you I repeat the instructions of the 13th Warrior, "Grow stronger." It is well worth your time and it gets you to pay attention during the entire game. If the unit is directly in front of you then by knowing how far on the table you deployed, plus how deep your opponent deployed, subtracted from the overall length of the table you will have the exact distance between you and your enemy. Next time we'll look at more complex guessing and little dirty tricks to use. Well here is one of many images of Reaper's Dire Drake Kaladrax. I then used multiple coats of drybrushing. 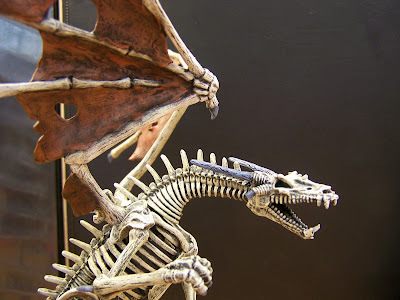 The Skelatal parts were drybrushed about 6 times with GW Scorched Earth. Then drybrushed about four times with GW Graveyard Earth. I then drybrushed 3 coats of GW Bleached Bone, and then hit it with one drybrushed coat of GW Skull White. The horns and claws were drybrushed with two coats of GW Shadow Grey. The fleshy parts of the wings were drybrushed 6 times with GW Scorched Earth. Then drybrushed 3 times with GW Dark Flesh, and 3 times with GW Vermin Fur. The base (not shown) was drybrushed in succesive layers of GW Codex Gray adding white. He took about 30 hours grand total including sanding, puttying, and painting. Use: Drop Minis in coffee can, cover with undiluted simple green, put the lid on, leave in garage, or other out the way location. (I wouldn't leave it in your house cause it will make girlfriend/ wife/ S.O. fairly uptight after the third day of smelling sassafras) I let this concotion steep for 5 to 7 days for maximum effect. Using your paint stripping brush scrub your model until clean. I would use the tooth brush on plastic minis because the paint stripping brush has a light sandinig effect on plastics you may not want. This is not exhaustive. These are rules that I will have in effect for this Blog. If you don’t agree please refer yourself to Rule 1 until you do. 1. My Blog my rules. 2. The First Amendment protects me not you. Since this is my Blog I reserve the right to edit, censor, delete, etc. I will leave most stuff alone unless it breaks these other rules. 3. Be gentle. I’m an amateur posting on my hobby. 4. Please no flaming or personal attacks. You may not agree with me and that’s ok.
5. Please reasonably and logically post your views and comments. 6. Please no profanity. If your vocabulary is so limited that you must express yourself that way then *&%$#@! use the old comics code way or bleep yourself. I’m trying to keep this work/family/kid friendly. 7. I’ll follow my rules. If I don’t, let me know. I'll post my rules later, but this is going to be my blog on my hobby and hobby related stuff so you should all hear from me soon.